I am always telling stories. I love to. I don't know what it is. I just like to tell stories. And some times I even re-tell them to myself. In bed at night when I can't sleep, I begin to write stories in my head. In fact, telling stories was one of the ways I would get through my long runs. That probably sounds so silly. I told someone this the other day and she looked at me like I was crazy. But to me it's not crazy. To me it's natural to tell a story in my head. I would re-tell the story of the day I had Asher. Or the time I held Faith, or the day I met Brandon. Those kind of stories. The one's that have changed me. I like to re-tell them. To remember them and describe them. Even if just in my head. I think a lot about the stories my kids will tell one day. About their mom. What will they say? What will they remember? What stories will they tell to their kids. Bella has this thing where she asks me all of the time "did you do this when you were a little girl too?" She loves to hear me tell her stories from when I was little, or from when she was a little baby. I think if that little girl could just sit in my lap and hear me tell her stories all day long, she would be perfectly happy. 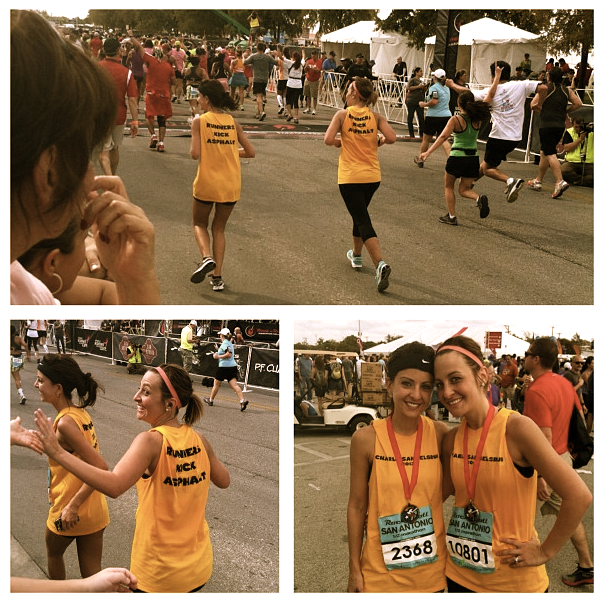 There were many reasons for why I started running....Why I wanted to run a half marathon. At some points it became a competitive thing for me. I got caught up in my time and pace and all kinds of non sense. One day when I was struggling through one of my runs, a thought ran through my head "Why are you doing this?" Why was I doing it? I had to ask myself that and really decide why. Because when it got hard, and I wanted to give up....When I really didn't want to put my shoes on and get outside, when I really just wanted to stay in bed....I had to remember why I was doing this. And my time or pace or any other comptetive aspect had nothing to do with it. I would imagine the 3 kids at the finish line with Brandon. I would think about them seeing their mom cross the finish line..... finish the race she set out to do. The long runs she would go on, and all of the time she put in, was for this. And they would see me finish. One day they will tell that story about their mom. They will not only tell this story, but they will tell them all...the good ones, the funny ones, the not so good ones and the really sad ones......And it will all make even more sense then, why she ran this race. I imagine Bella holding her little girl one day,...she'll tell these stories about her mom. And that.....that is why on the days I wanted to give up, the times I wanted to stop, the moments I questioned myself, I kept on going. To give them a story to tell. I am working on a recap post of the race... things I learned...the good, the bad and everything in between! Look for it this week. But I will say I loved it and am already thinking about my next one! I can relate! I tell stories in my head too. Sometimes the wording in my head is better than what makes it on paper...er...on the screen. I ran a half marathon when my first daughter was 6 months old, and I told her the story in her 6 month letter. I'm not trying to be obnoxious commenter here, who's like READ MY POST, just sharing in case you want to b/c telling my daughter about it (even in a letter she won't be able to read for years) was special. thank you for telling this story. i used to enjoy running, before i lost my daughter. i've been struggling to find my way back to it. for a long time i've had a dream of running a half marathon with my sister. and i was beginning to think that would never happen. but deep inside its a story that needs to be told, that needs to happen. thanks for reminding me of some of my why's and of my stories. ahh I tell myself stories too.. You guys are way better at writing them down and such. I just started blogging a few months ago and I feel like I can't keep up with everything. Congrats on your first Half!! I was looking for an email address but couldn't find one.. would love to contact you! girl this made me cry. and Im so excited for you for accomplishing your goal. What an awesome thing for yourself AND for your littles to see. Be so proud of yourself, friend! love you!!!!! oh friend! I seriously do/think the same thing! I am always telling my husband our kids are going to grow up and talk about how nuts I was lol . and seeing your loved ones at the finish line CHEERING you on?!? !